[110 Pages Report] The global healthcare consulting services market is expected to reach USD 15.88 billion by 2023 from USD 8.99 billion in 2017 and, at a CAGR of 10.2%. The base year for this study is 2017 and the forecast period is 2018–2023. Top-down and bottom-up approaches were used to estimate and validate the size of the market and various other dependent submarkets. The overall market size was used in the top-down approach to estimate the sizes of other individual submarkets (mentioned in the market segmentation by type of service, end user, and region) through percentage splits from secondary and primary research. The bottom-up approach was also implemented (wherever applicable) for data extracted from secondary research to validate the market segment revenues obtained. The key players in the healthcare consulting services market include Accenture (Ireland), McKinsey & Company (US), Cognizant (US), Deloitte Consulting (US), and Ernst & Young (UK). The global healthcare consulting services market is expected to reach USD 15.88 billion by 2023 from USD 9.76 billion in 2018 at a CAGR of 10.2%. Market growth is primarily driven by the growing geriatric population, the rising importance of value-based care; and technological advancements in healthcare. This report broadly segments the healthcare consulting services market by the type of service, end user, and region. The report also contains information on market share analysis and growth opportunities in the healthcare consulting services market in various regions. 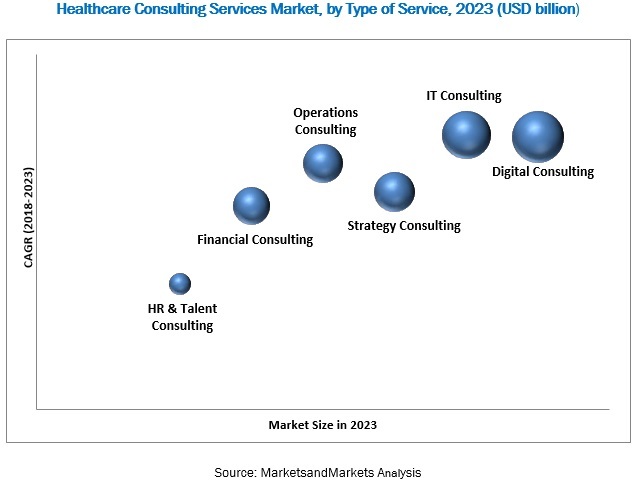 By type of service, the healthcare consulting services market is segmented into digital consulting, IT consulting, operations consulting, financial consulting, strategy consulting, and HR & talent consulting. The digital consulting segment accounted for the largest share of the healthcare consulting services market in 2017. Factors driving the growth of this segment include the shift from paper-based healthcare models to digital models in developed markets and increasing healthcare spending for building intelligent hospitals across the globe. The global healthcare consulting services market was dominated by North America, followed by Europe in 2017. Factors such as increasing M&A activity, pricing pressure on pharmaceutical companies are driving the growth of the healthcare consulting services market in this region. Asia Pacific, however, is estimated to register the highest CAGR during the forecast period due to the increasing need for remote care and telemedicine in rural areas in the region. Major industry players launched innovative products to maintain and enhance their position in the healthcare consulting services market. Accenture (Ireland), McKinsey & Company (US), Cognizant (US), Deloitte Consulting (US), and Ernst & Young (UK) have been identified as key players operating in this market. These companies have broad consulting services portfolio and a positive brand image, which gives them a competitive advantage in the market.